Though it goes by the humble moniker, Handsom Hollow Farmhouse, we think that Kate from AirBnB should describe this upstate New York farmhouse and barn as elegant, stunning, or gorgeous. Each room in the farmhouse has its own character, while the exterior of the property is highlighted by a massive restored barn that is ready to host any formal or casual gathering. This 19th-century farmhouse with 18th-century adjoining barn combines contemporary style with traditional architecture with delightful charm. The front porch wraps around the entire home, giving guest plenty of space to kick back and enjoy the fresh air. You can easily imagine yourself on a rocker, sipping morning coffee, listening to the harmony of birds and starting your day with a smile. The living room is a welcome dash of color to this elegant farmhouse. While the walls maintain their classic white tone, the interior appointments, including paintings, chairs, and throw-pillows, give the room a unique, energetic character. The kitchen is bright and charming, making it the perfect place to start your day. The white walls and cabinets have a timeless appeal, while the butcher-block countertop looks rugged yet tasteful. Elegance within simplicity seems to be one of the running themes throughout this farmhouse, and no room displays this better than the dining area. The simple wood dining table, small white side table, and single painting on the wall give the room a minimalist appeal. The one room that seems to break from the all-white tempo is the den. With a deep blue wall on one side and a black stove on the other, this room has a coolness that is not found in other areas. The bedrooms in this home all have their own character. The master bedroom, for example, maintains a sleek, clean white color theme that perfectly compliments the unique bed frame. The half-bath boasts a ceiling-to-floor window that can be opened up to let in the fresh country air. What farmhouse is complete without a clawfoot tub? The cozy bathroom's furnishings and wood floor are rustic, while the white and grey tile design painted on the floor keeps the room bright. The restored dairy barn gives the home a true sense of timeliness.This elegant space, which the owners have available for receptions, weddings, and parties, is visually stunning from the outside. From the inside, the open space leaves plenty of room for a large yet intimate party. 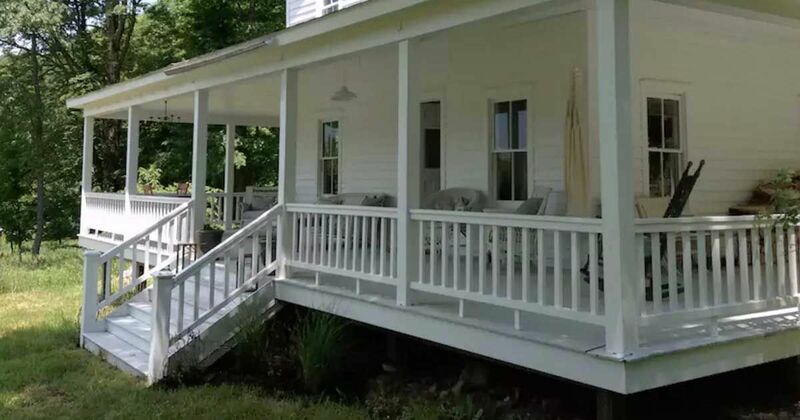 This home has a unique character that you won’t find from many farmhouses. Combining the comforts of an elegant hotel with the enjoyment of a wedding-reception venue, this “handsome” farmhouse has a lot to share!